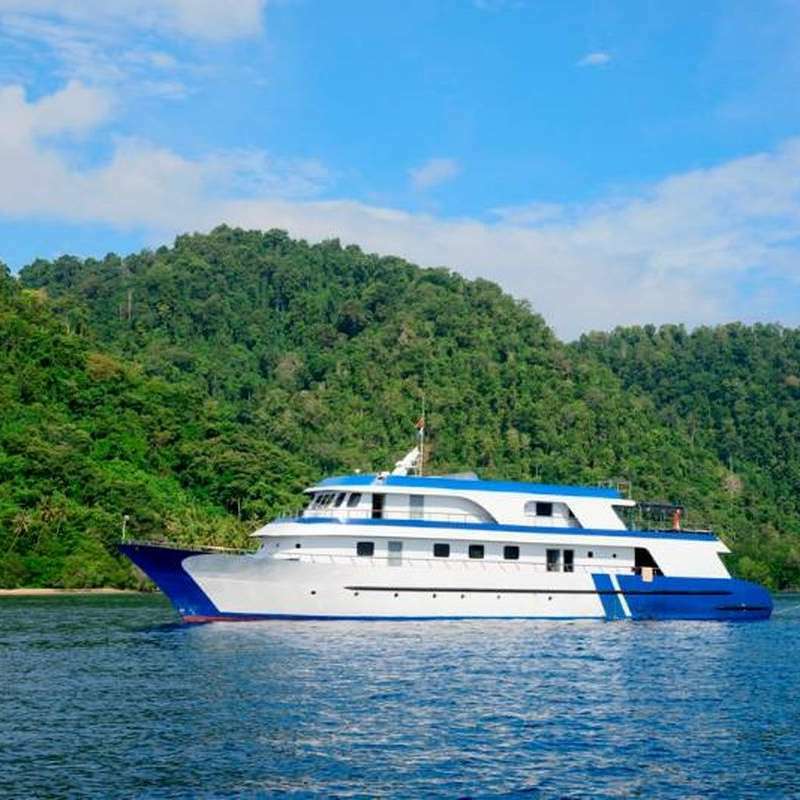 Maluku Explorer is a spacious and luxurious dive vessel providing cruises in the Indonesian island of Halmahera. It can host up to 18 passengers on board. 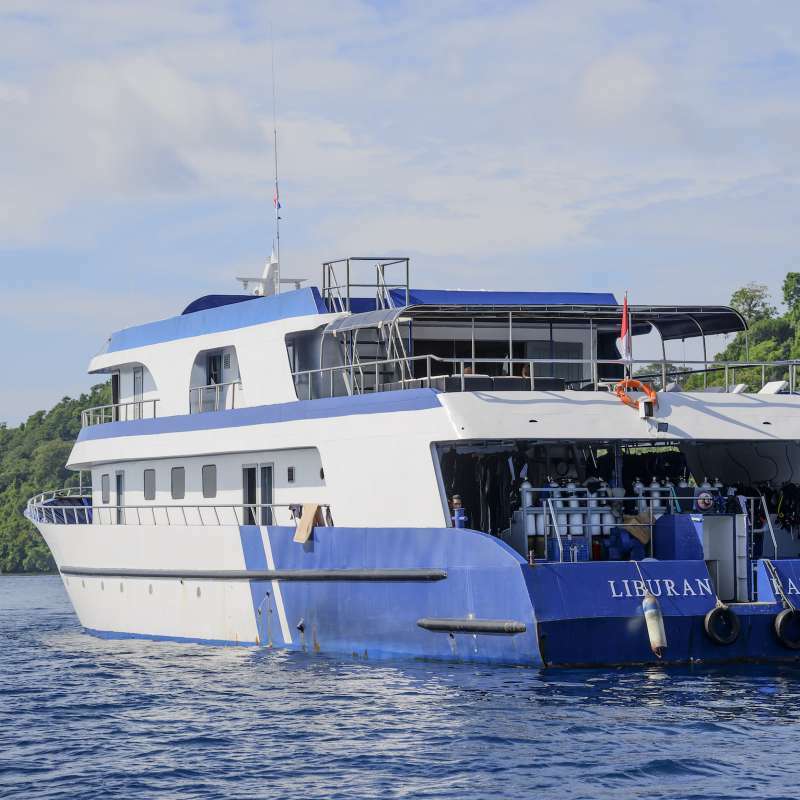 Maluku Explorer is a spacious and luxurious dive liveaboard offering a simple and relaxing lifestyle while visiting the most interesting and beautiful locations around Halmahera Island. She was built between 2010 and 2011 and measures 35m long for 8m wide. She is powered with 2 engines Caterpillar V10 450Hp so she can cruise at 13 knots per hour. You will find on board a 110/220 volt power. There is one general rule cruising with Maluku Explorer: if your hair is dry it is time to dive and if your hair is wet it is time to eat. The entire day is dedicated to scuba diving. That is why the huge dive platform located on the main deck is fully equipped with individual storage for your gear, a spacious kitting up area and 2 deck showers. Two tender boats will be used for diving (6.5m long, taking 6 divers each). Maluku Explorer is entirely air-conditioned. Between dives you can enjoy a massage or just relax on the sun deck, the shady rear lounge or in the indoor salon, all located on the upper deck. On the main deck is the dinning room where you will enjoy delicious meals. You will have a short breakfast before your first dive, with bread, tea or coffee. Next, a real breakfast will be served, chosen from a selection of Chinese and Indonesian favorites. Lunch usually consists of a soup and a variety of warm dishes, both Chinese and Indonesian. An afternoon snack will be offered after your third dive. At around 8PM, the bell will ring for a delicious dinner served by the stewards in the main salon. 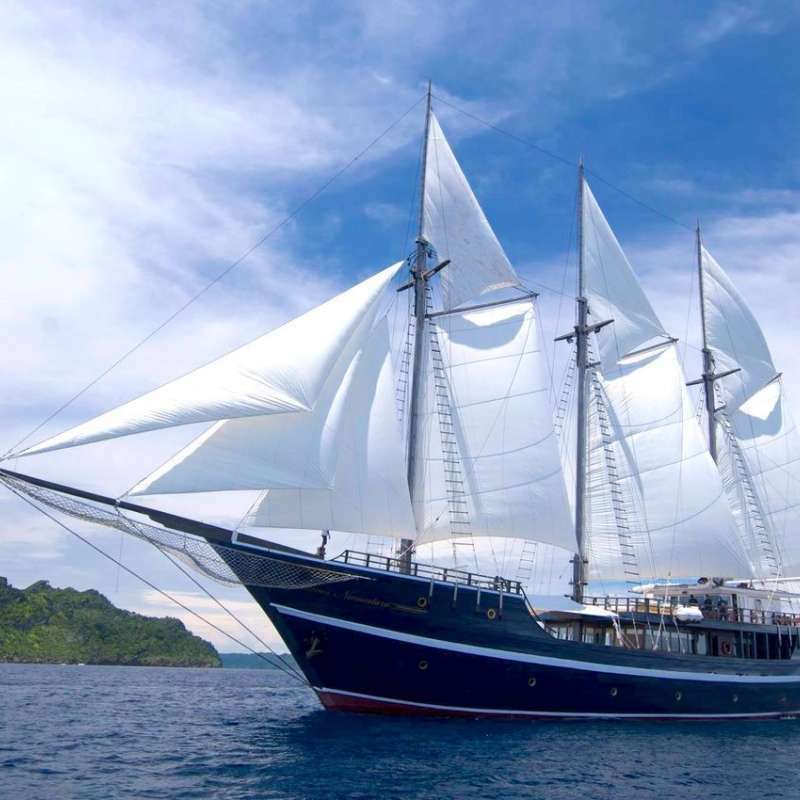 Maluku Explorer has 9 spacious cabins and can accommodate 18 guests with comfort. All cabins include air-conditioning, a private bathroom with shower, toilet and towels. 1 Premium Cabin (N°1): Located on the upper deck, it is very large and equipped with one double bed and a large panoramic window. 2 Master Cabins (N°2 & 3): Located on the main deck, one is equipped with one double bed and the other with two single beds, both including a panoramic window. 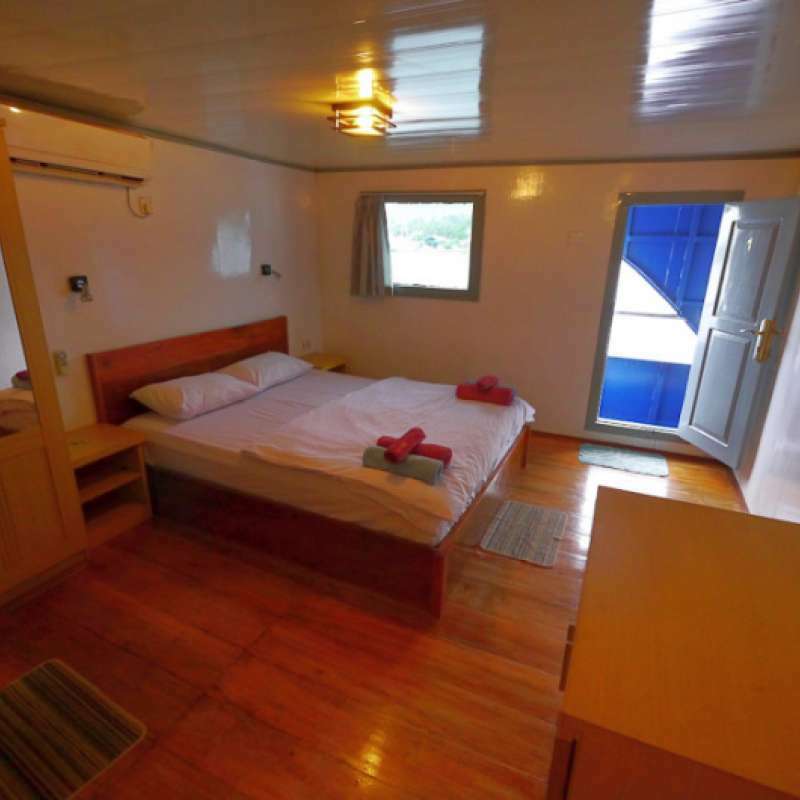 4 Twin Standard Cabins (N°4 to 7): Located on the lower deck, equipped with two single beds. 2 Single Standard Cabins (N°8 & 9): Located on the lower deck, they are slightly smaller and equipped with two single bunk beds. 3 dives per day, depending on sea conditions/route. 2 night dives per week, each one of them carefully prepared. All diving will provide expected guide to lead the dive. Dive insurance：Divers traveling aboard must have valid dive insurance. Crew Number：12, including dive guides. Dewi Nusantara ex-Paradise Dancer organise des croisières plongées aux iles Raja Ampat, c'est l'un des plus beaux bateau d'Indonésie. Il accueille avec de grands espaces un maximum de 18 plongeurs à bord. Mutiara Laut est un bateau de Luxe de type Phinissi avec 2 mats principaux, mesurant 46m et possédant 7 cabines agencées avec soins et détails pour 14 plongeurs maximum. Le Mutiara Laut est un choix idéal pour un groupe de plongeurs et non-plongeurs souhaitant un itinéraire sur mesure en Indonesie ou Asie du Sud-Est. Le KLM Sunshine est un bateau traditionnel Phinisi qui propose des croisières dans le nord du Sulawesi (Lembeh et Bunaken) ainsi que Sangihe, Buyat Bay, Halmahera, North Molluku et les îles Togian. Il peut accueillir jusqu'à 10 plongeurs à son bord.